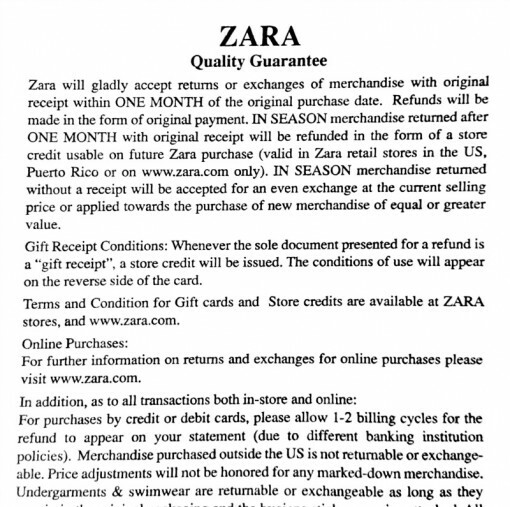 Normally, Zara allows any purchase to be returned within 30 days from the original purchase date as long as you have the original receipt (and didn’t cut the annoying way-too long interior tags off). However, if you ventured out to Zara’s Black Friday sale and purchased some items, then you’re in luck, you were allotted an extra 22 days to bring back your items for a refund in your original form of payment. From Black Friday on November 27 until January 17 in the new year is a total of 52 days for you to try on your item over and over and over again. And if you don’t like how it looked after the 24th try, you can return that Black Friday purchase no questions asked! The policy may seem a little odd with what seems like an arbitrary January 17th deadline, but it makes sense when you think about how most shop during the holiday season. It’s safe to say that Black Friday kicks off the holiday-shopping season and that the majority of gifts are purchased by mid-December, so extending the return policy around this event is good business sense. If you got your Christmas lights right after Halloween, odds are you had a pile of wrapped gifts under your tree by December 5th. And if any of those presents included Zara items, then you have additional time to return if you began your shopping early like a good Christian/consumer. And if you’re a procrastinator and checked off your Christmas list on December 24th, you’re not out of luck. You may not get extra time added to your return period, but you Zara’s regular 30 day return policy still applies for you and your lucky family members. Does Zara have a Christmas sale? Zara Black Friday Sale: Will Zara discount 30% off again this year? Will Zara’s 2016 winter sale come right after Christmas?